Your tried and trusted ways seem to be failing you. The nagging suspicion at the back of your mind is correct – things have changed. Today, 50-60% of the B2B buying decision is over even before organizations engage with vendors. The B2B buyer has become more informed. HERE IS YOUR CHANCE TO HEAR FROM AN EXPERT WHO HAS SEEN THIS EVOLUTION AND EMBRACED IT. Sanjeev Nambudiri has over 25 years of B2B sales experience across the world including in some of the most developed markets. As Co-Founder at Midas Touch, he designs strategies for B2B companies to help them navigate this transformed world. 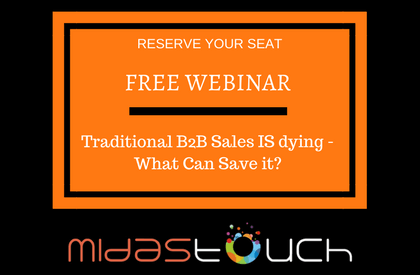 How B2B companies can survive and thrive!